Thanksgiving is just around the corner, but there's no need to spend a lot of time or money on a fancy centerpiece for the dinner table. With a few clear glass jars and simple objects you can find either in your backyard or your local supermarket, you can quickly put together a seasonally appropriate, aesthetically pleasing centerpiece that will add holiday charm to your dining room table on Turkey Day. Some of the DIY projects seen below include bowls of fruit, vegetable candles, tree branches in a vase, spraypainted pumpkins, a container of fall leaves, an acorn/candle jar, and platters of holiday nuts. 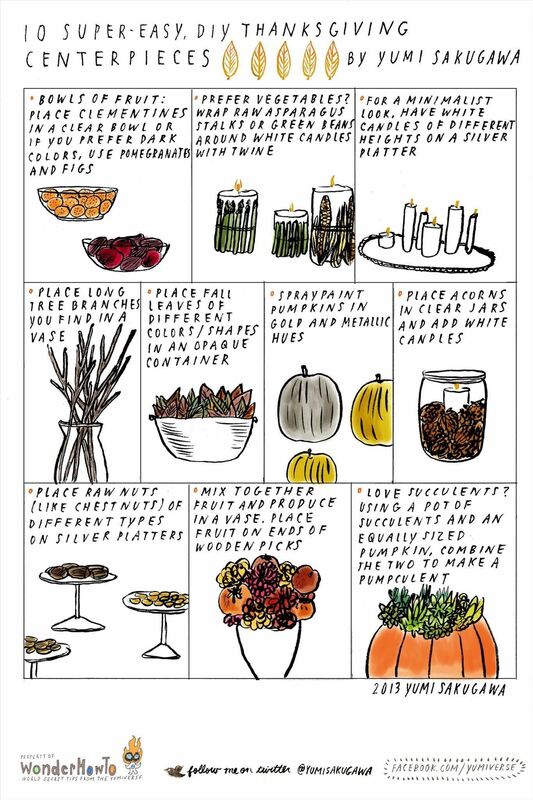 Got your own super-easy, DIY centerpiece ideas for Thanksgiving? Share with us.